John is our programme manager in Liberia. 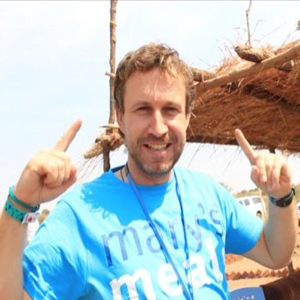 In his latest blog he shares news of Mary’s Meals’ latest expansion in the country. After almost three years of planning, Mary’s Meals began school feeding in Bong County, central Liberia in early April. We had planned to start feeding in September 2014 but the Ebola emergency changed all of our plans, as well as leaving an indelible mark on Liberia and its people. But life has to move on. During our launch event at the N.V. Massaquoi School, the local county education officer thanked Mary’s Meals for assisting the county’s children and called on parents and schools to come together to support food preparation and encourage students to attend school daily. The event concluded with prayers being offered for all the supporters of Mary’s Meals, asking that they may be blessed and continue to offer support so that all the students in Bong County can eventually receive a daily school meal. It was fantastic to see the 6,000 children in the five schools excitedly realise that they would be eating their favourite local food of rice. In Liberia we feed rice three days a week and Corn Soya Blend (CSB) twice per week. It has not taken long for news to spread and we have had lots of students and parents visiting and stopping us on the street to find out when the school feeding programme will reach their school. We have constructed a large warehouse in the city of Gbarnga and have set up an office in the garage of the guest house where a number of the team are staying. The warehouse and office are ideally situated to reach schools in central, northern and south east Liberia and all the students being fed by Mary’s Meals in Bong County are receiving locally grown rice. Bong County has a very turbulent past. It was the centre of hostilities during past civil conflict in the country, but the people have welcomed us with open arms and we are all starting to feel at home in the county. In partnership with the communities and schools with which we work, all the team are looking forward to reaching more schools, feeding more children and helping play our part in supporting education in this region of Liberia.